Ephesus, known as one of the most fascinating archeological sites in the world, was a large port and trading center at the crossroads of important trade routes, such as the King road and the Silk road. As the most visited antique site of Turkey, Ephesus is the gate to Turkey’s presentation to the world. Every year millions of visitors come to Ephesus for its marvelous and mystical atmosphere. Huge granite columns are witnesses of the city’s former magnificence and many worth-seeing sites surround it: the Artemision, one the Seven Wonders, Saint-John’s church, the Cave of the Seven Sleepers, the Shrine of the Virgin Mary, the Mosque of Isabey and the archeological museum of Selcuk. Originally Ephesus was a harbour city but due to the Menderes alluviums over the centuries, the site is now removed from the sea by about 5-6 kms. Located on the top of the "Bulbul" mountain 9 km ahead of Ephesus, the shrine of the Virgin Mary enjoys a marvelous atmosphere hidden between trees. It is the place where Mary may have spent her last days. Indeed, she may have come to the area together with Saint John, who spent several years in the area to spread Christianity. Mary preferred this remote place rather than living in crowded places. The house is a typical Roman architectural example, made entirely of stones. The church is situated on the north of the Harbor Baths. Its main entrance is at the Koressos Gate in the direction of Selçuk-Kuşadası highway. This church, one of the important edifices of Christianity, is the first church which was dedicated to Virgin Mary.The third meeting of the Ecumenical Council was held in this church in A.D 431. It was built in the 2nd century as a Museion and it measures 260m. by 30m. In the museion higher education was applied and medicine and other sciences were taught. Besides, the priests who occupied important positions at Ephesus were also trained here. The works of art are preferred to be exhibited according to the places where they were found instead of chronological exhibition. Different works of architecture and sculpture are exhibited harmoniously in the garden. Two big Artemis statues, head of Eros, little statue of Eros with dolphin, the fresco of Socrates are some of the world-famous works of Ephesus Museum. The artifacts obtained during the excavations have been exhibited in this hall for two years. On the right hand side of the entrance the Byzantine artifacts are displayed. On the right of the hall coins and other valuables are exhibited. Until the Roman era the bee, the symbol of Ephesus and the sacred deer of Artemis were depicted on the front and backsides of the Ephesians coins. During the Roman period on the front sides of the coins the emperors and their relatives and their attributes were depicted. The masks hanging on the wall were found at the theatre. The masks used during the performances were made of leather and wood. These stone made masks were used for decoration only. On the same wall the production of candles are also shown in drawings. Eros with masks, amphoras, Eros figurines, statue of Aphrodite, the bust of the comedy writer Menander are the important items of the hall. The unique ivory frieze found at terrace houses depicts Emperor Trajan’s war against the barbarians. In the Mediterranean climate of the Aegean basin, gardens and courtyards have always played an important role in traditional architecture. Because of this, a garden was designed to give visitors a place to rest and refresh themselves especially during the hot summer months. In the right handside of the garden located behind the museum, items such as sarcophagi, inscriptions and altars are worth seeing. The sarcophagus dated from the A.D. 2nd century is decarated with Muses. According to the inscription on the lid it was used in the Byzantine period again. And in the west of the garden grave stelae, votive offering stnones are exhibited. The sundial in the center of the garden is the ancient version of the clock tower that decorates the plazas of modern cities. It was discovered in the Tetragonos (Commercial) Agora in Ephesus. In this hall artifacts found in the tombs in and around Ephesus are displayed. On the right hand side on the panel are shown the examples of the tombs and burial types seen in Anatolia. On the left as one enters the hall, ceramics from the Mycenaean Tomb dated back to the 13 and 14 centuries B.C. and excavated in front of the St. John Bazilica are displayed. The Clazomenain sarcophagus made of clay, in the middle of the hall, was found in the Commercial Agora area. In the hall the grave stelae and osthoteks are also displayed. In this hall the busts of the emperors and their family members are exhibited. The statue to the right of the entrance belongs to Consul Stefanos. On the left, the original friezes from the Temple of Hadrian are displayed. The altar in the middle is from the Domitian Temple.The altar is decorated with friezes on three sides. The head and the hand of the Emperor Domitian are some of the most interesting piece of the hall. Near the far end of the room, the statues of Emperor Augustus and his wife, Livia, and the fragments of the Parthian monument are seen. The temple is at the beginning of the Selçuk-Kusadasi road. This temple, one of the Seven Wonders of the Ancient World, was first popular around 334 to 250 BC. It was destroyed and had to be rebuilt seven times because of earthquakes, looting and fire. Today there is nothing left of the Ionic structure surrounded by massive columns but its altar area. The temple was made with the world's best marble and was a truly gigantic structure. Some of the remains are in the British Museum in London. The present temple site was from the Hellenistic period. It is thought that similar to monotheistic religions, the Ephesian Artemis combined the strength of many gods. The temple had 127 columns, on a field 105 by 55 meters and was 17.65 m high. The altar was approached by 13 steps. Lydian king Croesus donated the 36 columns on the front. There were a number of priests officiating at the temple, along with a high priest. It was considered an honor to be the high priest. There was another class of priests serving the temple who were called "curates", who were named for demi-gods in mythology. Mythology said that when Dionysius was born from Zeus' leg the curates were instructed to make noise so Zeus' wife Hera would not notice. In the same way these curates made noise when Artemis was born from Leto. One of the noteworthy features of the Temple to Artemis is that it functioned as a bank. The high priest was also a credit officer and was security for those who deposited valuables in the temple or who made sizeable contributions. The drawing at the side shows something off what the temple's former glory must have been. To see the drawing enlarged simply tic it. Of those things that set this temple apart, the most important was its being a safe haven for those who took refuge inside. This, of course, led to quite a population of criminals living in the temple. There are those who say that the cult and religious practices of Artemis, along with the temple were established along lines similar in structure to bee communities. 8 km. 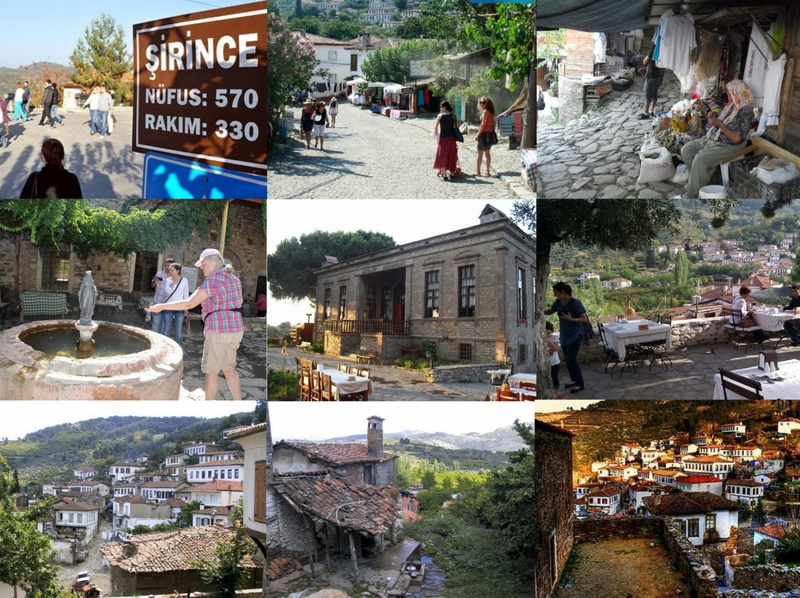 from Selçuk, Sirince village is a regional tourist center for day trips. Leading to its center at an altitude of 350 m above sea level is an asphalt road. The village dates back to the 5th century. Its old name was Kirkinca or Çirkince. There were several reasons for the village's settlement. First, the mountain it settled on was good for protection. Second, it was away from malaria that was rife in the Selçuk-Ephesus area. Finally, there was plenty of water, the soil was fertile and the climate was ideal. According to some sources, the village was established in Aydinogullari times. Others say it was the Derebeylik times. The name Çirkince may have come from a group of people set free by the Derebeyliks. When asked if the place they were to be settled in were beautiful the answer may have been "Ugly" ("cirkince" in the local language). The village was emptied at the time of the deliverance of Izmir and resettled with Turks coming from Thessaloniki. When the then mayor of Izmir, Kazim Dirik Pasa, came to visit the village, he heard the "village march" composed by the local schoolteacher and was quite moved by it and rename the village Sirince ("charming"). The architecture of the village is different from other villages. The houses are two-story, made of stone or brick, with many windows all the same size. Hanging balconies, basement cellars with kitchens are also characteristic. The window frames and eaves are decorated with pictures and bird motifs. There are two churches in the village, a restored grammar school typical of the period, and a fountain and a monastery in the village.Among the sources of income to the village, the pre-eminent one lately is tourism. Thousands of local and foreign tourists come to the village every month of the year, take pictures, eat local pastries, and drink the locally made wine. Apple, cherry, peach, and strawberry wines made in local homes are favorites of all who taste them. The locals also grow peaches, grapes, and apples for sale. The Museum is situated around 10 km. from Selçuk and lies within boundries of Çamlık village. It is situared in an area of 16 acre. Ataturk had his headquarters here and kept his special white train at this station during Aegean manoeuvres, controlling them by being in close proximity to the coast. The Museum which has one of the largest steam engine collection in Europe displays 25 50-80 years-old- steam TCDD (Turkish Railway Company) locomotives. Following the road leading east from beside the gymnasium of Vedius, one comes to the Cave of the Seven Sleepers. Christians during Roman imperial times had real problems because to the Emperor Cult, that demanded they sacrifice to the emperor in a temple built for him. When they failed to do this they became enemies of the emperor and state. The legend is that in the times of the emperor Decius there seven young Christians who refused to offer to the emperor and were consequently forced toe flee the city and take refuge in a cave. After sleeping for a time they went back into the city to get some food and found out they had slept for 200 years. Christianity was now widespread in the Roman Empire. Theodosius II heard the story and accepted it as a sign of the truth of human resurrection. The idea or resurrection was being debated at the time. Excavation in 1927-28 found a church and hundreds of graves here. Many grave inscriptions were addressed to the seven sleepers. For centuries, people wanted to be buried as close to the seven sleepers as possible. Some are even brave enough to say the Mary Magdalene was buried here.